The hilarious musical spoof Spamilton: An American Parody starts February 12. Go behind the scenes with the creator, writer, and director of Spamilton: An American Parody, Gerard Alessandrini. 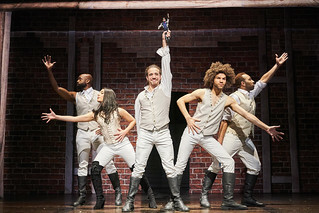 Audiences can't stop laughing at Spamilton: An American Parody. See what they are saying about this hilarious musical spoof. Critics say Spamilton: An American Parody is a whole lot of fun! See what they are saying about this laugh-out-loud comedy. Get a sneak peek of the hilarious musical spoof Spamilton: An American Parody. Five questions about Spamilton or, everything you need to know before buying a ticket to the “Hamilton” parody. NEW YORK — They say everyone’s a critic, and that may be one of the reasons behind the enduring appeal of Gerard Alessandrini’s unsinkable, incisive musical parody revue “Forbidden Broadway.” “We love to knock down anybody on a pedestal,” he says. And the bigger they are, the harder they fall. Aaron Burr, Leslie Odom Jr.
Get tickets for you + 3 of your friends with code MEPLUS3 and enjoy $10 off per ticket. Available Sunday – Friday evening performances through March 10.